Damn the Science Exhibit; We’re Looking at Dioramas! A small community on the coast. A couple of months back I found myself in Anchorage without too much to do. On my last day down there the devil that sits on my shoulder lost a debate with the nerdy bookworm that sometimes passes for my angelic adviser, and so I actually chose to do something instructive and educational. I went to the Anchorage Museum. Don’t be too disappointed; it was actually kinda cool. My favorite part of the museum was actually the science exhibit, much of which was interactive. sadly, I don’t think my pictures and videos did much to capture the brilliance which was that particular part of the museum. 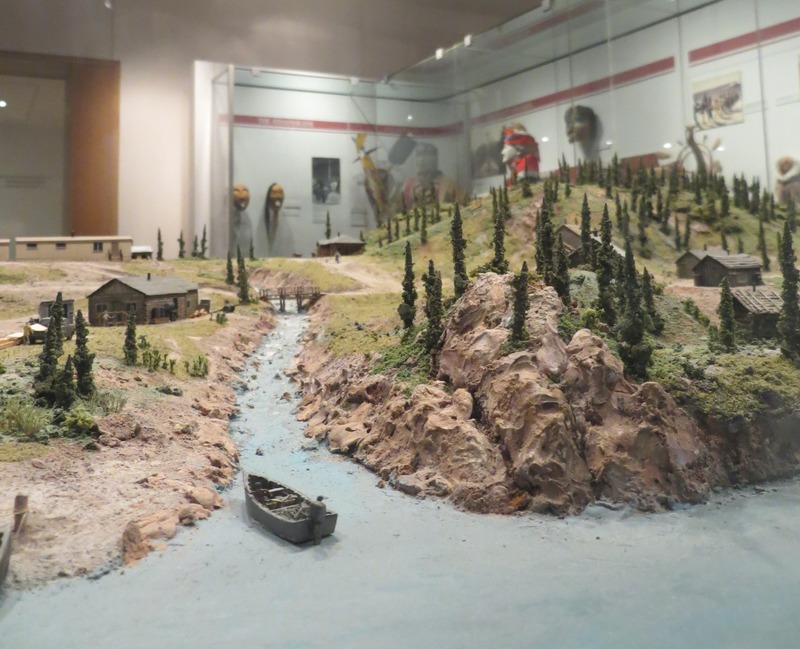 Being a museum, the place was of course full of wonderful artifacts and displays casting light on all manner of things Alaskan. Being a cruel fellow, I am not going to show you much of that. Today, we are looking at dioramas. A number of these were strewn about the museum, and I managed to get few decent pictures of some. I won’t pretend that this is a complete set, so to speak, as I am pretty sure that a few of thee exhibits told my camera to screw off and I completely neglected to right those wrongs, but at any rate, these are the pics I got. Both my devil-advisor and my nerdy-near-angel hope you enjoy them. Quick Note: rather predictably, the scenes depicting Alaska Natives seem to have got most of my attention here. Depending on how broad you want your paint strokes to be we can bundle the Native Alaska population into 3, 5, or lots of general groups. I would normally go with 5; the natives of the outer Aleutian Islands (Aleutian or Unangan, depending on who you ask); the Alutiiq (or Sugpiak) of the Eastern Aleutians parts of the Southwest coastal region; Yupiit of the Western coast, Inupiat of the Northern coasts, and Athabaskans who occupied interior Alaska. For those wondering, the Yupiit and Inupiat are the natives once commonly referred to as ‘Eskimos’, but we aren’t going to do that here. …oh, and let’s not forget the Northwest Coastal natives, who are ironically located in Southeast Alaska. When I say “Northwest Coast natives” I am referring to a common classification used by anthropologists to break the Native American population into about 10 distinct culture areas. So, ironically enough, Alaska’s Northwest Coastal natives are in the Southeast. …and if that manner of speaking seems weird, then the devil on my shoulder is well pleased. I don’t seem to have pictures (even bad ones) for Yupiit or Alutiiq populations. I don’t know if Missed an exhibit or if I just wasn’t in a button pressing mood when I happened upon them. So, we have here representations of 3 native populations (depicted more or less as they might have lived prior to contact). I also have a few other pieces on the Alaskan Railroad, the Aleutian Campaign of World War II, and one beautiful scene of a community that I failed to identify (cause I’m a bad man). This piece represents Northwest Coastal natives. This part of Alaska is about as far from Barrow as Orlando is from New York. Lots of mini muktuk for the mini villagers! Yes, they still do this. Add a few modern tools to the diorama, and this could be a Spring hunt today. These are the railroad shops of about 1919. The shops are of course where railroady stuff got fixed. This represented an Athabaskan community hunting caribou. Definitely not the best picture, but this is another pic of the Athabaskan village. Aleutian Home haunted by a reflection from some other exhibit. This depicts the Aleutian Campaign in World War II.